Regional cooks have learned how to make authentic Mexican rice recipes to establish this cuisine since the fifteen hundreds. When the Spaniards first brought rice into Mexico, they found the warm moist climate perfect for growing this crop. Since that time, rice dishes have become a major part of the main meals of Mexico. Rice along with corn is the main carbohydrates of the Mexican diet. When I learned how to make authentic Mexican rice recipes, I found they might be as simple as a scoop of cooked rice. 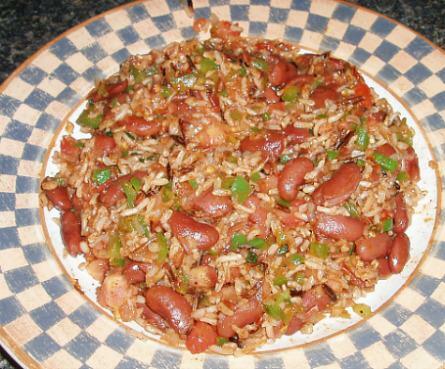 This might be as a side dish to fish or chicken or it might be rice with a combination of other flavorful ingredients. Many times I have seen pans of rice with fried eggs on top. It is often combined with savory beans (like the Mexican rice and bean recipe) to make a protein dish and seasoned with many wonderful peppers. When I learned how to make authentic Mexican rice recipes, one of my favorite is called Spanish rice. I have loved this flavor since childhood; long before I was aware of the popularity of Mexican recipes. It is flavored with green peppers, onions, cumin, salt, pepper and garlic; I like a little ground beef in it also. All this is blended with uncooked rice and tomatoes and tomato juice; then it is baked until the rice is tender. How delicious! Authentic Mexican rice recipes are best made with long grain white rice and every day many families enjoy a variety of rice recipes like the following. Put half of the oil in a large skillet; sauté the onion and garlic until the onion is tender. Add the celery, bell pepper, tomatoes, chilies, cilantro, lemon juice, salt and cumin; steam fry until the veggies are bright but still crisp. Stir in the beans until hot. Add the rest of the oil and the cooked rice. Mix well and serve. In a large skillet heat the oil. Cut chicken in squares. Season with salt and pepper. Cook until golden brown on both sides. Remove chicken and put in a covered dish to keep warm. Add rice and green onions to the skillet and cook stirring frequently until rice is golden. Stir in the broth, tomatoes, cilantro, parsley and black pepper. Bring to a boil. Return the chicken to the skillet and any liquid from the chicken in the dish. Cover and cook mixture over low heat for 15 minutes. Add the corn, chilies and pimentos and cook another 15 minutes. Put half of olive oil in a skillet; sauté onion and garlic until onion is tender. Add remaining ingredients; steam fry until veggies are bright and still somewhat crispy. Add 3 to 4 cups cooked rice and remaining olive oil; mix well and serve. Fry bacon until crisp and drain on paper towels; crumble and set aside. Pour out all but 2 tablespoons of the bacon drippings. Add onions and green pepper to drippings; cook until tender about 5 minutes. Drain tomatoes in measuring cup; add enough water to juice to make 1 ¾ cups. Cut up tomatoes and add to onion mixture; add tomato sauce, sugar and salt and heat to boiling. Remove from heat and stir in rice; pour into greased casserole dish. Cover and bake 35 minutes or until rice is tender and liquid is absorbed. Fluff rice with fork; sprinkle with cheese and bake 5 minutes longer.